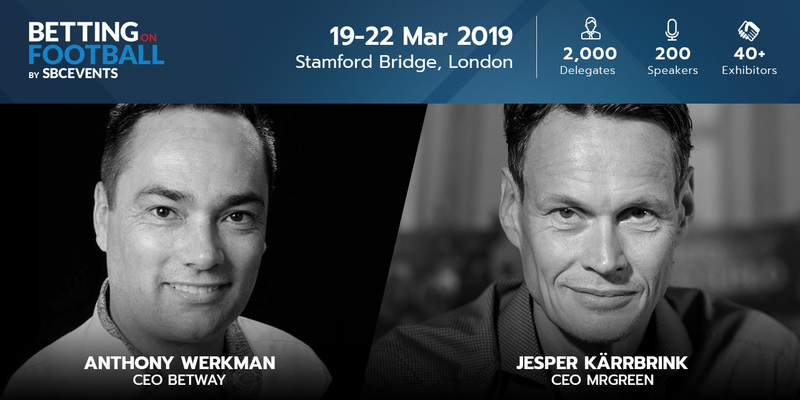 Ahead of this year’s Betting on Football (19-22 March), SBC caught up with two of the event’s headline speakers – Jesper Kärrbrink (Mr Green) and Anthony Werkman (Betway). The pair will be taking part in the CEO panel, held as part of the ‘Leadership & Vision’ track on Wednesday 20 March, which will be looking at the industry’s response to a disruptive 2018 and the key values that need to be challenged to regain both public and political trust. SBC: What can be done to offset the high-profile government restrictions that beset the industry in 2018? Jesper Kärrbrink: It is a bit ironic, while the industry never has focused more on responsible gaming and anti-money laundering, we have never been this exposed in the common debate. As an industry, we are heading the right way with most operators investing heavily in both tools and training for responsible gaming and AML. However, with a business model based on high churn and extensive marketing and customer acquisition, we risk coming out as aggressive and even greedy. Over time, we need to be more focused on retention and entertainment, and also build the story that we (as an industry) actually care about our players and are trying to help those who risk ending up playing too much. Anthony Werkman: At Betway, we don’t feel that these restrictions are unreasonable. As an industry it is our responsibility to implement truly responsible strategies that cover both player protection and keeping crime out of the industry. The governments rulings should therefore not be thought of as restrictions, but rather policies that force implementation of a strategy that all operators should be implementing on their own. SBC: How can the public’s trust in gambling be restored without a change in the media’s approach to focusing on the bad, rather than the good? AW: Quite simply, actions speak louder than words. The way to change media perception is to ensure that as an industry we change the way we act. If we all act responsibly together and ensure the proper checks and balances are in place that ensure we eliminate problem gambling, we can start to take responsibility for the narrative that surrounds us. A good example of this is the agreed whistle to whistle ban on advertising. This shows how when the industry works together, we can self-regulate where there was a clear problem, and we can create a positive outlook for our sector. JK: Trust comes from within, it starts with how we see our own business. For Mr Green, this is about prioritizing Green Gaming in all business decisions, not to cut corners just to grow a bit more but to have a long term view on the business where the aim is to grow and drive a sustainable business. And be open when we make mistakes (because we do) and learn from those. Over time the public and media will see us as the entertainment companies we are and that we do our best to stop over-consumption. SBC: Both from a product and regulatory standpoint, what are your biggest hopes for the industry in 2019? JK: Increased personalization. This will lead to a better product – from a players perspective -, less risk and higher retention. The better we know each customer the easier it is to be compliant. When we really know our customers, detecting riskful behaviour, whether is gaming pattern or money laundering will be easier. AW: Product wise we will be keen to see responsibility built in to game design as well as continual improvements in the way we interact with our customers through our interaction programme, so that responsible gambling becomes an intrinsic part of our customers experience. SBC: What do you expect, or hope, to be the biggest takeaway for delegates from the operator CEO panel at Betting on Football? AW: That they get a genuine sense that industry is better working together on issues that are upsetting the public, causing political concern and inviting media focus. We have the tools, the know-how and increasing the collective will to act on these issues and it’s time for us all to adopt a responsible approach to our future ambitions. JK: That we say something that provokes and creates people views to change some. A conference like Betting on Football is a great opportunity not only to meet people but also to get something new to discuss when coming back to the office. Betting on Football is held 19-22 March and is the only trade conference that brings together decision makers from international operators to address the recent issues and opportunities in the sports betting industry. Stamford Bridge provides the perfect setting for 200 expert speakers across 40 sessions, including high level business and networking opportunities for key suppliers, top affiliates and sports clubs & organisations to meet with the operators. For more information about the event, please CLICK HERE.